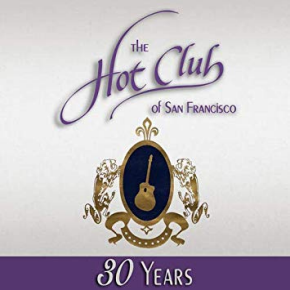 The Hot Club of San Francisco started 30 years ago to share the music of guitarist Django Reinhardt and violinist Stephane Grapelli and their Hot Club de France. 30 Years, their 15th recording is an outstanding homage to the longevity of the music and this band. Mixing in studio and live in concert performances, the project has a vibrant feeling, no matter where the audience. The ensemble of talent creating the music here is fantastic, led by Paul “Pazzo” Mehling on guitar, Jordan Samuels on guitar, Isabelle Fontaine on guitar and vocals, Evan Price on violin and Sam Rocha on bass. The 13-track set is a nice of styles and compositions including Reinhardt, an original by Price, and tunes by Cole Porter and John Lennon and Paul McCartney. This is a jubilant, elegant, display of artistry.